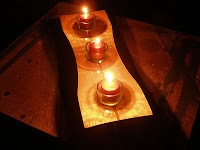 Three candle holder made of quilted maple and mahogony. Approximately 18" long and one inch high. I took the board and cut it to 18" (2" for each candle plus 2" empty space). 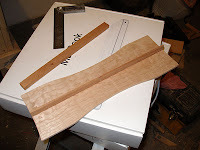 I made a template out of hardboard for the curves in the hourglass sides and ends. After cutting the hourglass shape I realized the quilted maple needed something contrasting to set it off. I ripped the hourglass in the middle and added a strip of 1/4" mahogony resawn from a 1 1/2" turning blank. The blank wasn't long enough to use a single piece, so I made two pieces that met in the center. I didn't properly join them since the middle candle hole would just cut that piece out anyway. Clamping was a bit of a challenge since the idiot maker (me) cut the curves before clamping. 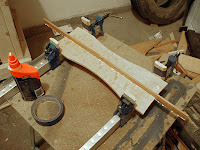 Using rounded pine pads on my clamps, I gently clamped at the ends where the piece was still parallel. I didn't use as much pressure as I would have liked, so I let it set for 2 days. I did scrape the glue after 20 minutes so it would be easier to remove. After it dried I started looking at ideas for legs. Originally I wanted something fancy, a flare coming to a point above the board maybe. But the simplicity of the original design called for simple legs as well. 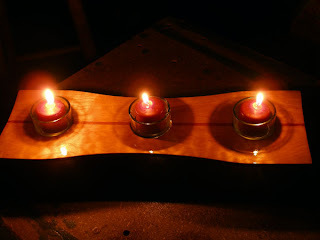 I used two 1/2" x 1/2" x 1" legs on either end of the piece, just outside of the candle holes. Looks nice and the design fits the project as a whole. Stability was a question, however, so I did some tests. 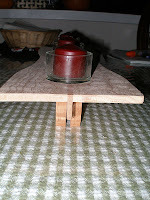 Because the weight of the dishes and candles are on the centerline with the legs, on a hard level surface it's quite stable. However, on the tablecloth it's anything but. Since this is an anniversary gift for my wife (Nov 17), I'll wait to see where she wants to put it. If it goes on a shelf or the mantle, I'll leave it as-is. But I have a set of "feet" ready to add for stability if necessary. 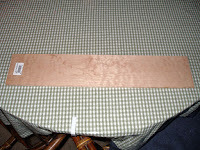 My sanding schedule was: Light shaping with 50 grit, followed by 150, 220. 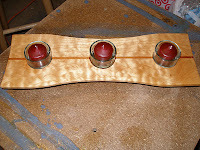 Finish was provided by Zissner's "clear" shellac in a rattle can. Schedule was: 6 coats, sanded with 400 grit, 3 coats, sanded again with 400, 1 coat. I got a nice smooth glossy finish on the quilted maple that really showed the quilted pattern. I have to say, I'm a huge fan of shellac. I like its repairability, its quick drying time, its durability, and the fact that it's a completely renewable resource. Unlike polys. Once the shellac has had a chance to completely outgas, I'll apply a coat of Butcher's wax and box it up. I may even make a wood box to put it in.